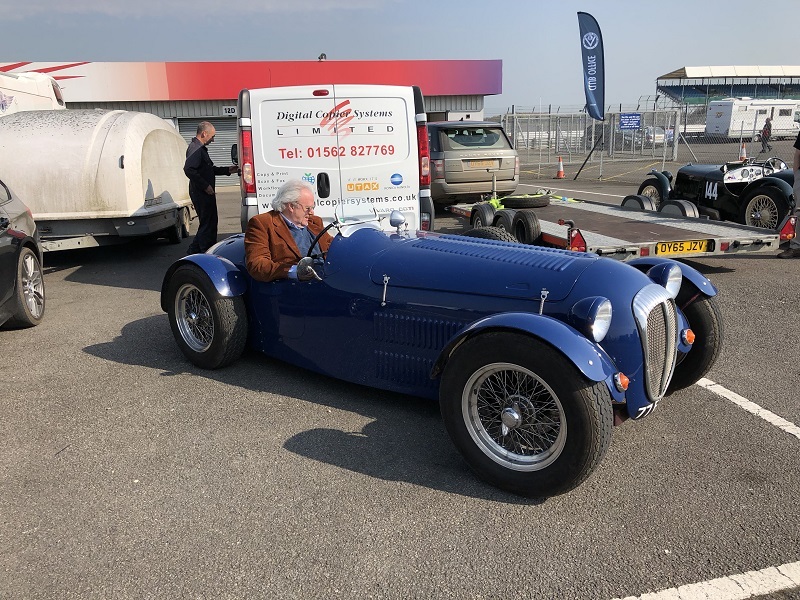 Welcome to Part 2 of our report on our visit to the first day of the VSCC Formula Vintage 2018 Round 1, on Saturday 21st April. In Part 1 we looked at the racers. Now we’ll look at the sports cars. We’ll use a fairly broad definition: if it looks sporty, whether open or closed, it goes here. If it tends towards the more luxurious and is closed, it’ll go in Part 3: the Great Cars. 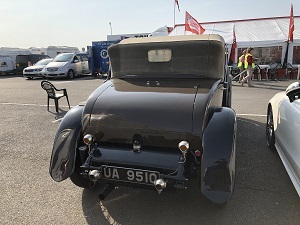 When you arrive early at Silverstone Vintage Racing (8 am), there’s a wonderful calm, and time to chat to the few people who are already there. 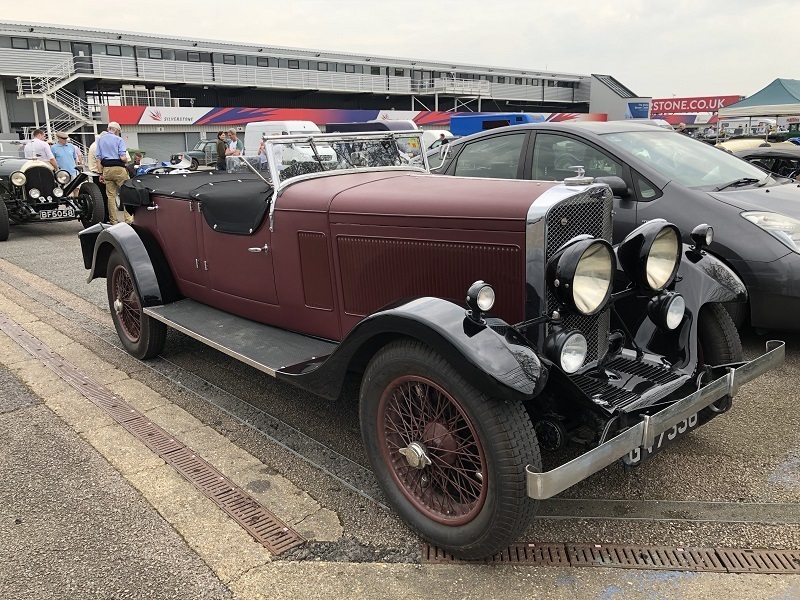 Peter Parry’s lovely MG was sitting in the Media Centre car park in splendid isolation. We had a chat, and the sun obliged by alighting upon the car. This was almost certainly one of the most beautiful cars in the whole of Silverstone that day. It is very rare: only 28 made in Mk 2 form, and only 2 known to be in the UK. The 2-litre V8 is the only engine of that configuration that Fiat ever made. The 8V designation apparently derives from Ford’s ownership of the copyright on “V8” at the time. 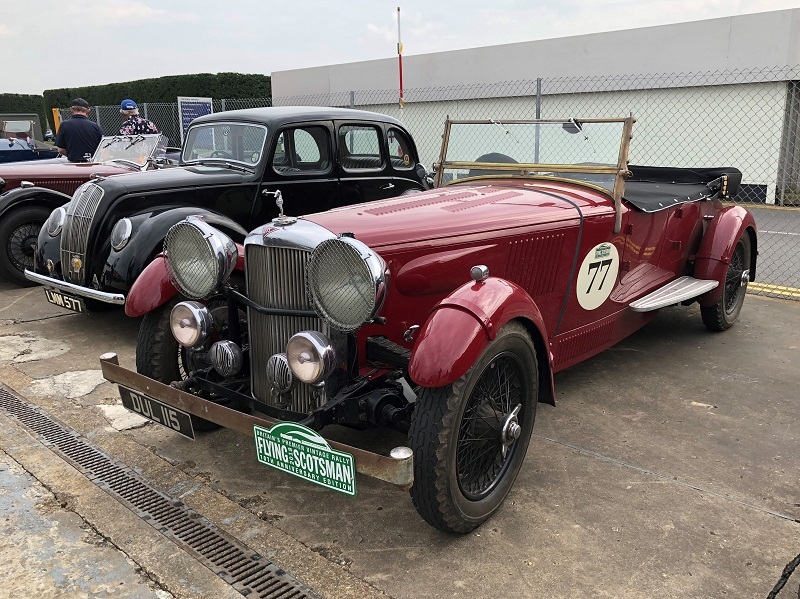 In Part One we mentioned the number of Bentley “Hot Rods” in the paddock. Lovely things, but this has its original body. Clare Hay’s book says so, so that’s good enough for us. 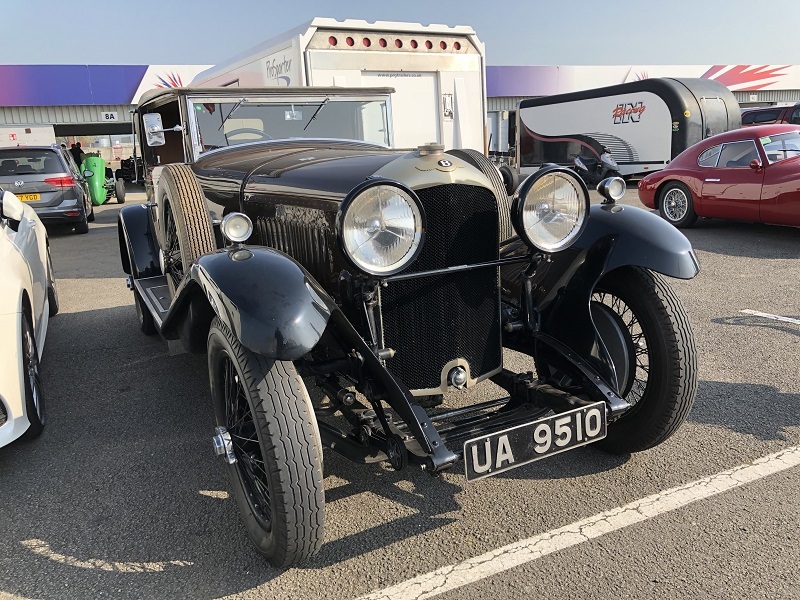 There is something very special about an original-body Cricklewood Bentley – and this one, in our humble opinion, is a handsome beast as well. Before the owner of this car arrived, it had already caused a stir. Everyone rather liked it, although they weren’t sure what it was. 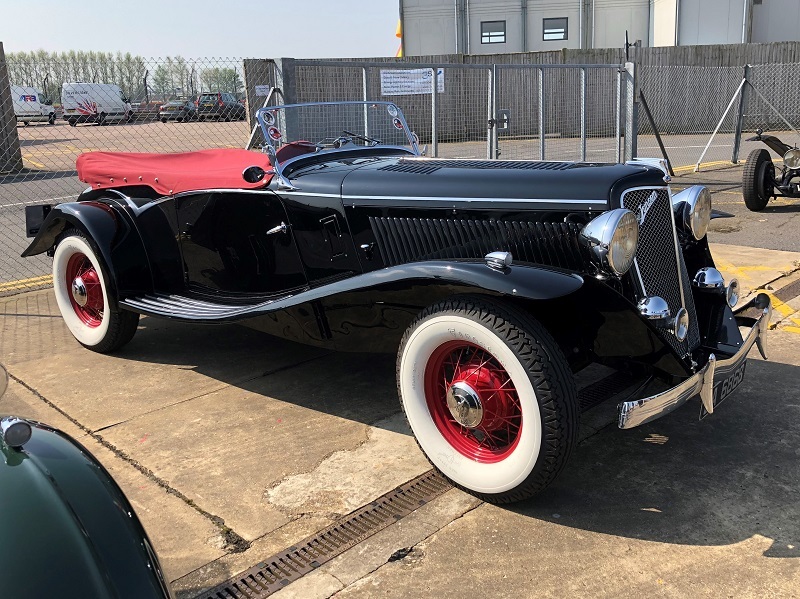 The louvres on the bonnet, however, were just wide enough to see the air cleaners of a V8, and the Daimler grille did the rest. The owner then confirmed that it was indeed a Daimler SP250. He’d rather comprehensively totalled it, received the insurance payout, and then decided that he couldn’t think of anything nicer to buy. So he bought the wreck off the insurance company and built this body on it in fibreglass. It is considerably lighter than it was before (about 350 kg less), and goes like stink! 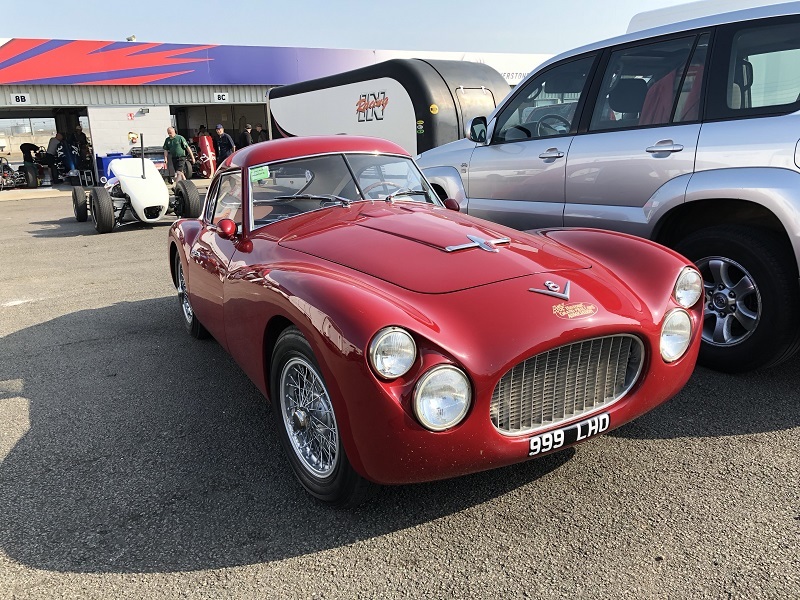 We said that we were using a fairly broad definition of a sports car, but there must be a sport somewhere in the world of pulling the skin off a rice pudding – and this charming little car would certainly want to enter. 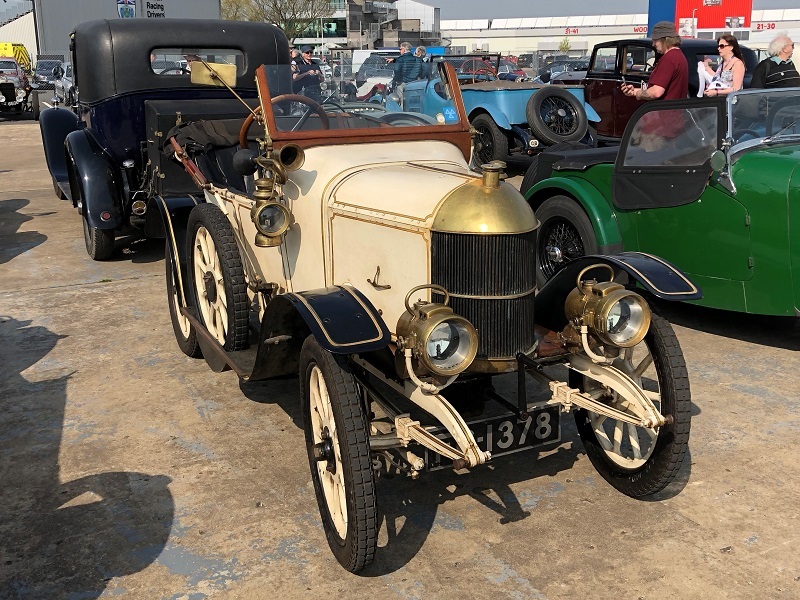 It’s from the very first year of Morris production, with a White & Poppe 1,018cc four-cylinder side-valve engine with fixed cylinder head, acetylene lights, and a big VCC dating plate on the rear deck. The perfect car for the cad-about-town – or international film star. 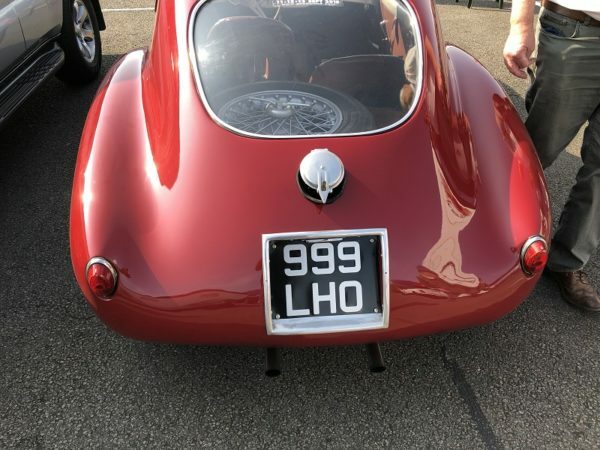 We didn’t meet the current owner, but using the number plate on the internet revealed that the new owner in 1971 wrote to Motor Sport in the March edition to ask what it was. He had even written to Jensen Motors, who couldn’t identify it. He thought that it was a Jensen Ford, because he knew that, before they made their own cars, Jensen built custom bodies on cars such as the Ford V8. This is indeed such a car, with a flathead V8 of 3,622cc. There is a beautiful picture on the internet of Clark Gable with his Jensen Ford. 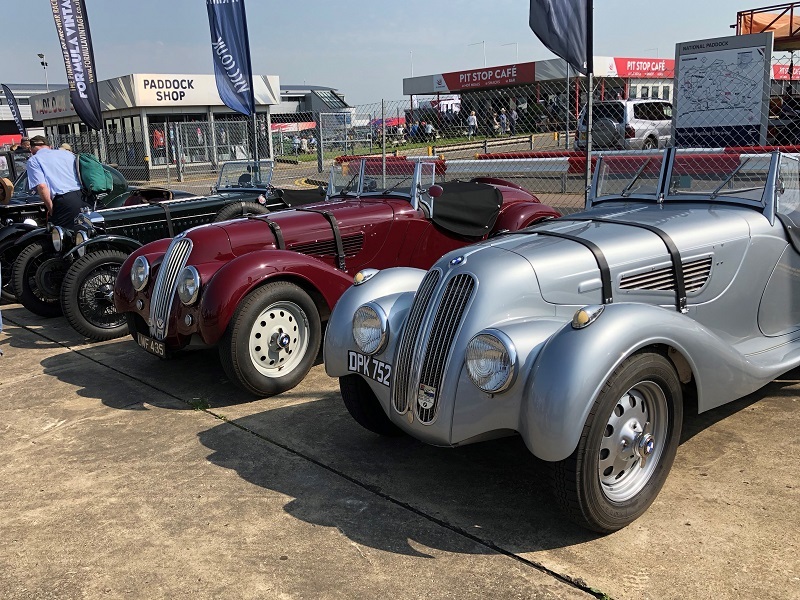 Two generations of Frazer Nash sitting together, reminding us of the history of the company in the late 1930s, when it started to import BMW 328s from Germany until the war intervened. 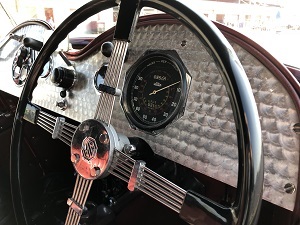 The very special 2-litre engine that powered these 328s, with hemispherical combustion chambers, was taken over by Bristol and developed for its cars after the war. No, it doesn’t go in Part 1 – because it wasn’t racing on the day. 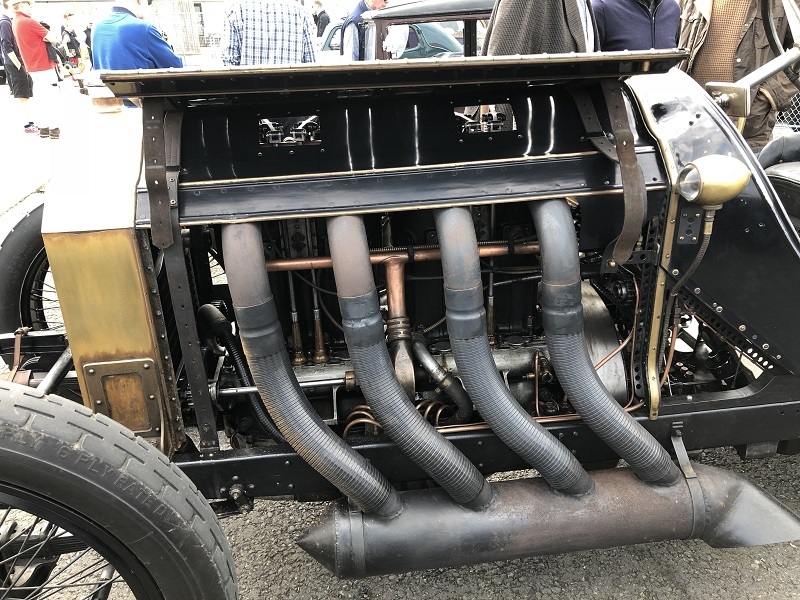 We loved the sheer mechanical brutishness of this old racing car. 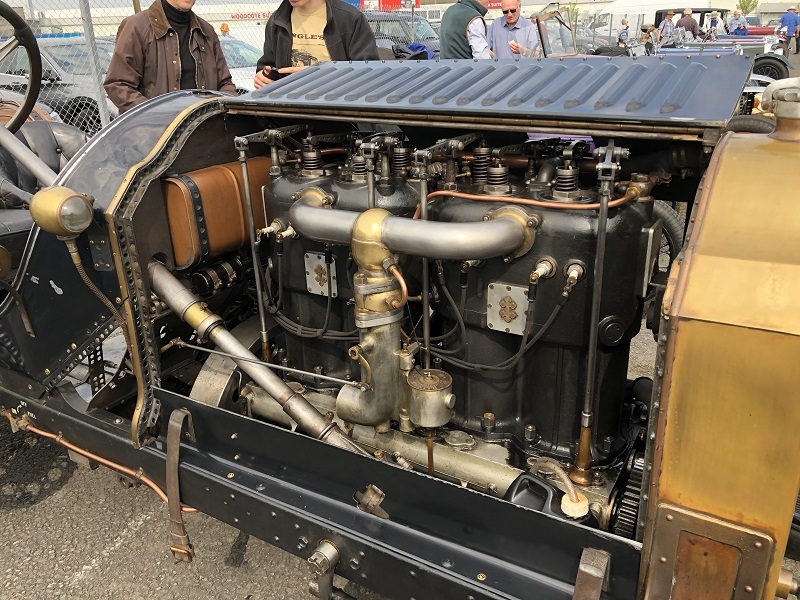 We overheard someone, who knew the car and its owner, saying that it had been built up over several years from different bits. All we do know is that the engine is a 15,095cc four-cylinder. 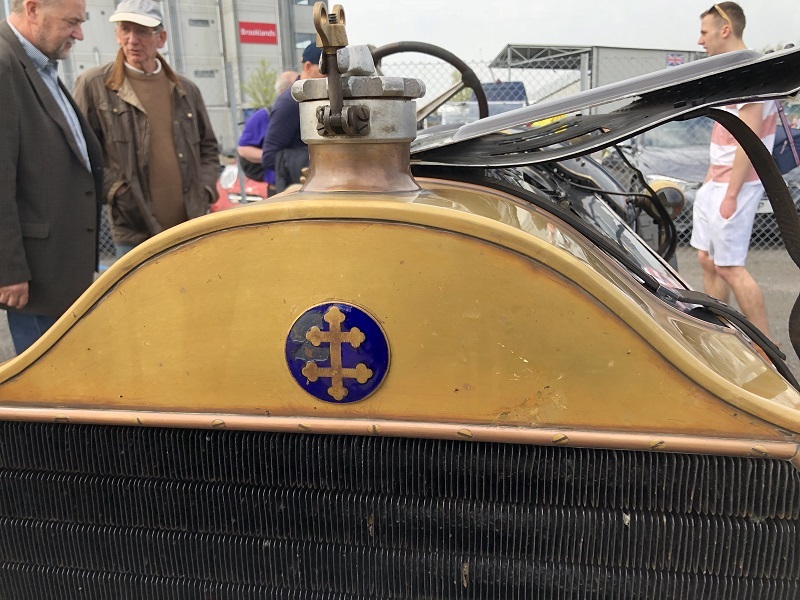 The cross of Lorraine is proudly displayed in all sorts of places around the car and engine. One carburettor for that much capacity! Lorraine-Dietrich started life as a railway locomotive manufacturer, Société Lorraine des Anciens Établissements de Dietrich et Cie de Lunéville, and moved into car production in 1896. The company had one plant in Niederbronn-les-Bains, Alsace, the other in Lunéville, Lorraine. In 1904, Niederbronn ceased car production and simply sold a Turcat-Méry, badge-engineered as a de Dietrich, into the Alsace market. Disdainful of this, Lunéville put the cross of Lorraine on the grilles of its cars to distinguish them. The owner of this car proudly explained how reliable and lovely to drive it is. 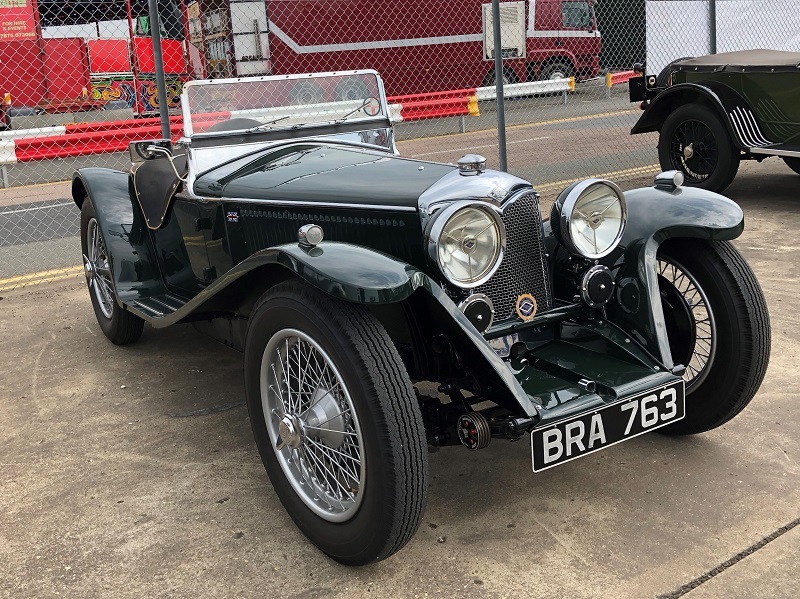 He was clearly putting his money where his mouth was: he was off within a week on the 10th Flying Scotsman Rally: four days from the Home Counties to the heart of Edinburgh – the original destination of its famous steam-powered namesake. As for the challenge of the rally, he looked us straight in the eye and said: “It’s tough.” Earlier in the day, Ian Polson, distinguished restorer of vintage and PVT cars and SAHB member, had given his apologies for the SAHB Spring Seminar, because he was due to be providing expert technical support (“spannering” is another word for it, if your fingernails get dirty) for the rally. This had to be included – it’s such a little jewel of a car. The two gentlemen with it love it to bits, but gave a warning. Unless you are of limited stature, you will not fit in it. 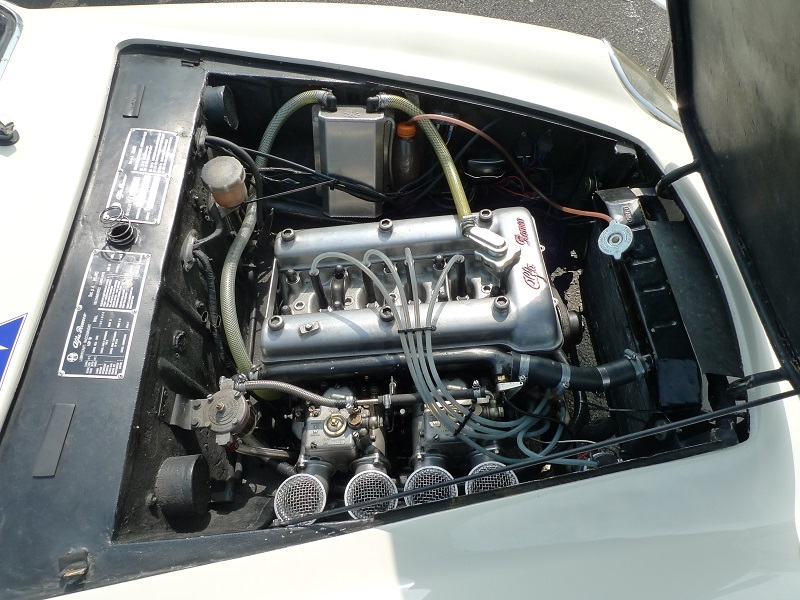 It has a 4-cylinder 1,087cc engine with typical Riley twin-high-camshaft valve-gear. Not very many were made (perhaps 120), but a solid 80 or so survive. Not surprising! We mentioned Ian Polson earlier. He had this Roesch Talbot for sale on the day. He strongly believes this to be the ultimate vintage-era Talbot and Georges Roesch’s personal favourite model of all his creations. It has the ultra-smooth 2,276 cc six-cylinder engine and a ‘silent-third’ manual gearbox. 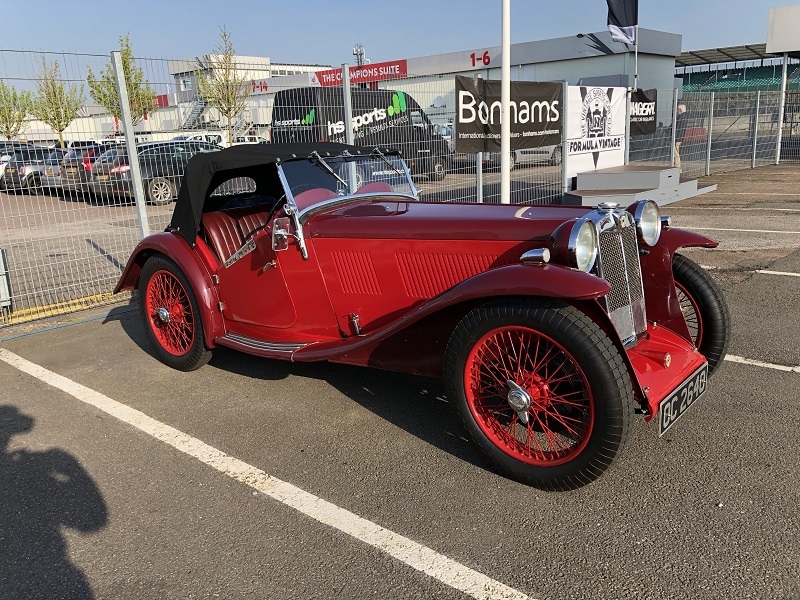 Ian restored this car a few years ago for a true Talbot enthusiast. Too often, we don’t get to see the engines of the cars at Silverstone. But for a few minutes the bonnet was up. This is the classic twin-cam Alfa engine that powered so many of its finest post-war cars. The car is a very rare SVZ, a successful sports racer in its day. Only 16 SVZs were made, and only 3 or 4 were made with the classic Zagato ‘Double Bubble’ roof that this one has. For sale by Tom Hardman if you have the cash. The price was overheard. We retired, devastated. 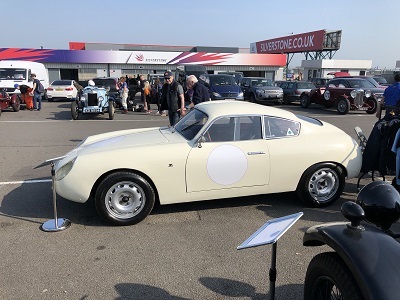 Keep an eye out on this website for A Vintage Day at Silverstone – Part Three: The Great Cars.